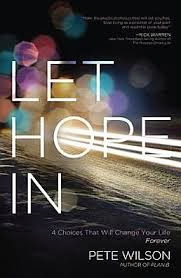 Let Hope in -4 Choices That Will Change Your Life Forever By Pete Wilson has got to be one of the very best Christian book I have read in a long time. This book is like a devotional or as I say study book because you will want to read it over and learn from it. I love Pete Wilson's writing style and how he can really get us to think not only about how we view other but ourselves as well. This book really shows you how to let hope in. I had been going through some tough times and it really helped me a lot. I would recommend this book for all people Christian and non- Christian alike because its a great study and is bound to help anyone no matter how big or small their problems are. He tells us stories about people he has helped minster to and how their stores could help with our walk with Christ its really a great book and I will be adding it to my continuous study book pile for books I read over and over again. If you know of anyone who could use a bit of encouragement I sure hope you buy this book for them. I also recommend you read it yourself because its has everything you could want in a Christian help book. I will be following this author and getting every book he writes, he is that good and such a refreshing author. I was able to read this book through book sneeze its really one of the best book I have read all year! !